Limited Run Games to distribute physical editions. 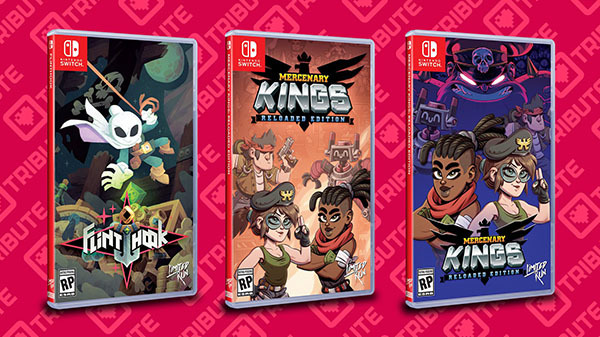 Tribute Games is bringing Flinthook and Mercenary Kings to Switch, the developer announced. Limited Run Games will distribute a limited run physical edition of each game. A release date was not announced. The developer also announced that Mercenary Kings will receive a free update on February 6 dubbed Mercenary Kings: Reloaded Edition, which adds two new playable characters, new knives to craft, new gun parts to craft, and many other minor features and improvements. The game is currently available for PlayStation 4 and PC. Get an overview of each game below. Look really cool with slow-motion powers! Slow down time to adjust your aim or pull off a tight stunt – do it often, it recharges real quickly and it makes you at least 200% cooler.